Just like switching to bright nail polish and suddenly going from a completely black/grey wardrobe in the week to floral prints; our infatuation with bold, tribal-print pieces always emerges when the sun comes out... and its starting. I did a piece of a few weeks ago on Warehouse's tribal collection - but since then, there has been a ripple on the red carpet / LA of celebrities ditching the maxi for the mini when it comes to wearing tribal print skirts. 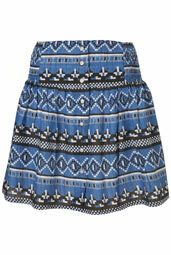 This look is for the brave - tribal print skirts are also usually quit tight fitting, if not body-con style. However, they do look amazing on and the complex print of the skirts are slimming as it diverts the eye to the pattern rather than the 'mass' underneath it. I hardly ever wear minis, but I have tried a few of these on (I can confirm, I have a sizable rear and my legs need some work), and they look great. The Missoni one is great but yes I think the cheaper options are more for my budget! I think the Linn skirt from ASOS is my favourite here.